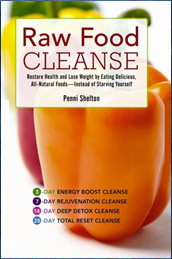 Raw Food Cleanse is written by Penni Shelton, director of the blog Give It To Me Raw and Real Food Tulsa. This book is designed to help readers discover the benefits of a raw food diet and to put them on the path to reclaiming optimal health. While Raw Food Cleanse is based on introducing readers to a raw food diet, Shelton says that setting yourself a goal of eating 80% whole, fresh, raw, ripe, organic foods will give you amazing results. In the beginning of Raw Food Cleanse readers answer a series of questions regarding eating habits, physical health and lifestyle factors. This will help you to understand the things that may be contributing to your weight and health challenges. Based on your answers to the life cleanse questionnaire and your personal needs for cleansing and weight loss you then can select from several different dietary plans. Shelton suggests that everyone begins with the 3-day cleanse because this gives you the opportunity to discover how your body responds to the cleansing process. Some people experience detoxification symptoms such as headaches, nausea, and fatigue while others report none at all. This Raw Food Cleanse is based on raw juices, green smoothies, salads and low-glycemic fruits. This longer Raw Food Cleanse is recommended if you are recovering from a lifetime of poor diet and lifestyle choices, or toxic environmental exposures. It gives your body systems a chance to rest, restore and rejuvenate. This is very similar to the 3-day cleanse but with a little more variety for food choices. This cleanse is appropriate when you have a bit more weight to lose and if you have already been successful with a shorter cleanse. It promotes a deeper detox, renewed energy and increased fat loss. The first seven days are liquids only and the remainder of Raw Food Cleanse is a diet with a very high proportion of raw foods. The longest Raw Food Cleanse is advised for those with more serious health issues and the most weight to lose. You will follow a liquid diet for the first 10-14 days consisting of fresh juices, smoothies and raw soups. This is followed by a diet based on a variety of raw foods. Leafy green vegetables, beets, bell peppers, carrots, tomato, zucchini, apples, berries, bananas, mangoes, melons, oranges, pineapple, seaweed, avocado, coconut, olive oil, almonds, cashews, chia, hemp, flax, macadamia, pumpkin seeds, buckwheat, lentils, oats, quinoa, apple cider vinegar, Celtic sea salt, miso, vanilla, herbal tea. Exercise is recommended in Raw Food Cleanse because it can promote deep healing and more rapid weight loss. Walking in particular is encouraged for those new to exercise to provide a gentle introduction to movement so as to improve health, fitness and wellbeing. Yoga is beneficial for increasing flexibility, massaging the internal organs of the body, enhancing detoxification and muscle toning. Additionally rebounding on a mini-trampoline is recommended to stimulate the internal organs, move cerebral-spinal fluid, improve digestion and enhance immunity. Raw Food Cleanse: Restore Health and Lose Weight by Eating Delicious, All-Natural Foods – Instead of Starving Yourself retails at $12.95. Can help to cleanse and detoxify the body. Emphasizes the benefits of breathing, yoga and exercise for reducing stress. Provides meal plans and a large selection of raw food recipes. Includes inspirational stories of those who have achieved good results with the Raw Food Cleanse. Requires a significant overhaul in eating habits for most individuals. Most people will experience some degree of detox symptoms including headaches, nausea and fatigue. May be difficult to do the longer cleanses while maintaining normal daily routines. A large proportion of the Raw Food Cleanse is devoted to testimonials. Raw Food Cleanse provides readers with an introduction to the benefits of a raw food diet and includes a selection of cleanses ranging from 3 to 28 days. It will appeal to dieters with chronic health problems and those who are interested in learning more about a raw food cleanse.